In other news, Russell with 28 and 5. Mediocre is better than trash. Atinkson is a great coach in the making, he gets the most out of what he has , something luke has serious problems with. I seriously would have loved Atkinson on this team. I guarantee you it would have been a totally different look for the better. The Coach also needs a good and stabile front office and organization to prosper. That’s a large part of I mean the really the biggest part of why I’m not excited about this Riley/Spo rumor. I mean I don’t think the rumor is true but if it is true we just had a major turn over in our front office we don’t need another one we need to get some stability so we can start to grow. So if we could just get a new coach and a new coaching staff then that’s great but I see no reason nor any benefits why we need to flip over the front office again. Magic's been on the job for two years. We've got enough of a sample size of his moves that we could conclude that he's not a good pobo. He's terrible at evaluating talents. Why would you want to stick with someone like that? Continuity is only important if it's good continuity. I disagree I don’t think Magic/Rob have done anything overtly poorly. I think the biggest thing holding us back has been our coaching situation which they did not have anything to do with. Why did the Wolves Fire Thibs immediately after a blowout victory? The only thing this team is missing is the GOAT player who currently recovering from an injury. Missing Kuzma hurts us too. It's not coaching, or Front Office, it's the fact that we're missing arguably our two best players. I’d really like a new coaching staff. I don’t care about keeping or not keeping Luke one way or the other but I really really really would like a new coaching staff. And that has nothing to do with this game I’ve been saying that for the past 2-3 years since Luke has been the head coach. I say we immediately hire him as Associate Head Coach. Wow, I wonder what happened with Thibs? That's strange to fire a coach after a blowout win. Better act quick Maginka and Jeannie! If Minny fired Thibs after that game then it certainly was a fireable offense for Luke too..
At least we ain’t the Bears. I missed the game today and I'm so happy I did because my whole mood would have been ruined watching this game. This team is so horrible and w/o promise that I feel like a Knicks fan. They were probably wondering the same thing everyone else was. In a 20+ point blowout why is KAT still on the floor. They read my posts calling him a dumbass. Dude is playing Towns late in a blowout. He never learns. He thinks every minute of the game is Game 7 of the NBA Finals. Just another lackluster performance from everyone, at this point if they don't care...I don't either. 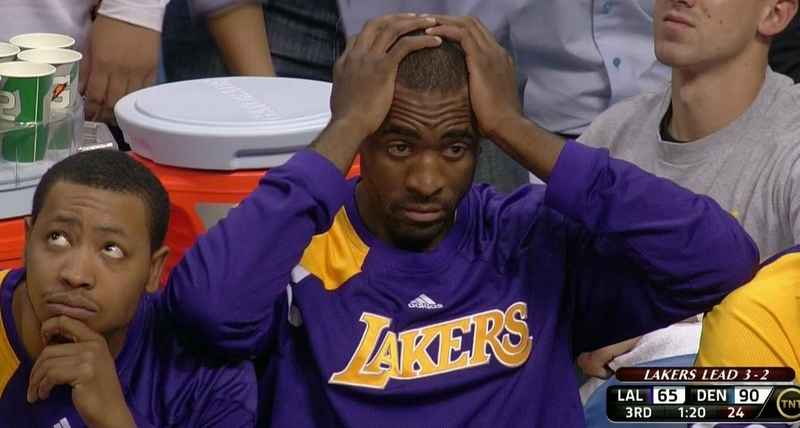 Someone had to be held responsible for the Lakers' play.